There is something serene about a moon coming up over water. 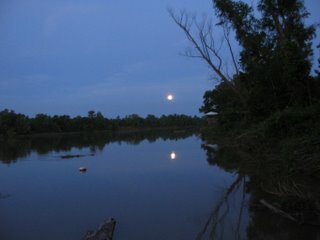 We are lucky in that our dock is placed to view the moonrise every month. This was last night. Today was a big bird day for small birds. 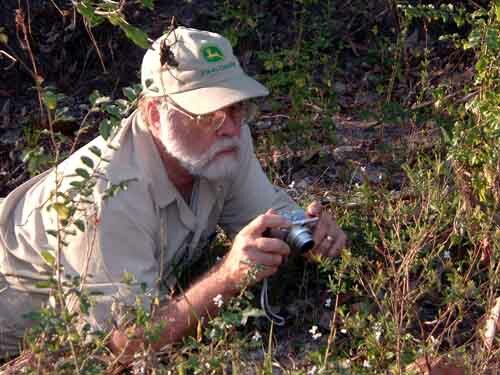 As promised, Dave Patton came out to the house to band ruby-throated hummingbirds. Also attending were Dugan Sabins and Jim Burke, both from Baton Rouge. We trapped and Dave banded 27 hummers, 15 females and 12 males. One of the females was previously banded in our yard in 2004 and was a return capture this morning. She was mature in 2004 and would now be at least three years old. Dave says all of the females appear to be nesting now and probably have eggs incubating, since there was no evidence of eggs about to be laid by the females we captured. People ask how the birds are captured. 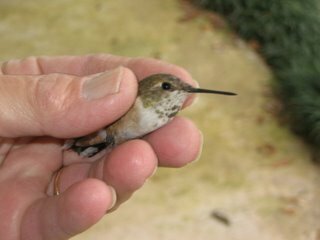 You have to be really fast to catch them by hand, like this rufous hummer caught this winter. Ha, sure. Dave uses a wire cage with a trapdoor on one side. A small feeder is placed inside the trap and the birds enter to feed and the trapdoor is released – preventing their escape. Why do they go into the trap in the first place, instead of just avoiding this contraption? We keep dummy traps around some of our feeders so the birds get used to them and when Dave comes he just substitutes the real trap and that does the trick. This morning we trapped and banded steadily for about three hours. The picture at right shows one of the birds we banded this morning returning to feed within an hour of being banded– an indication that there seems to be little trauma associated with handling them. 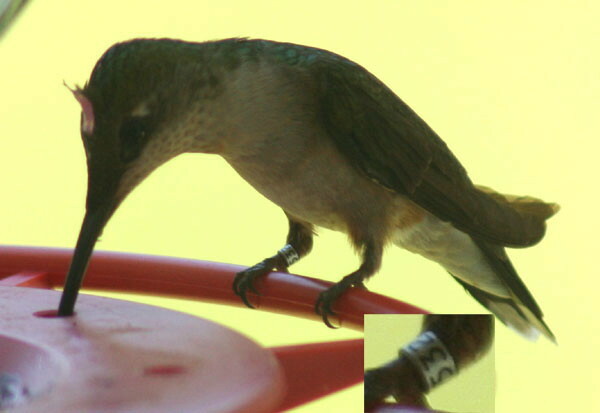 Dave took this picture and you can see the band on the right leg - and the inset shows the number on the band. There is a small dab of temporary paint placed on their heads to indicate the ones we banded today. You can see this if the bird reenters the trap so it keeps you from retrapping them. It wears off pretty soon. We had a good time and it will be interesting to see if some of these birds return next year, considering all the things that could happen to them. I’m still amazed that they fly so far every year and can live to do it eight years or more! 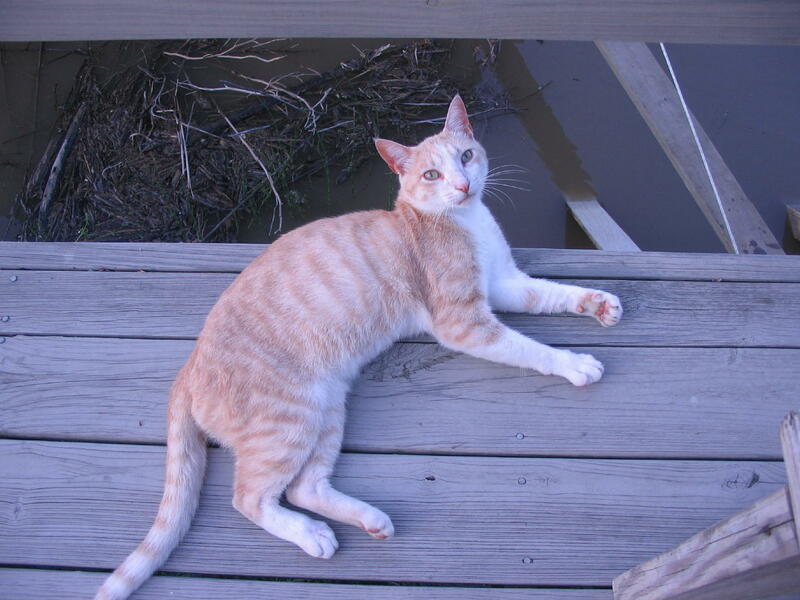 Napoleon is recovered and is back to being his old energetic, inquisitive self again. Because he thinks we trap the hummingbirds just for his benefit, he spent the morning locked up in the shop while we did the banding. He is just too quick. By the time you notice he is about to do something, he has already done it. I felt sorry for him spending several hours in the shop all alone so I went and released him as soon as I could. Well I shouldn't have been concerned because instead of his being at the door meowing to get out, he was sound asleep on the seat of the John Deere lawn mower. And, he stayed there for another hour instead of coming outside. I think he was intending to teach me a lesson of some kind. The river is at 8.2 feet on the Butte La Rose gauge, and will stay about the same for the next five days. The Mississippi and Ohio are both rising moderately and that may keep the water where it is for another week or so. We are kind of in a holding pattern.